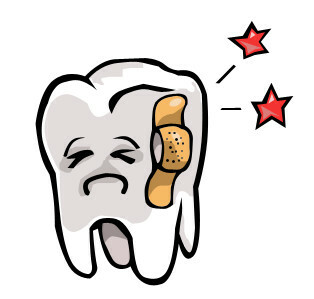 " Barely remember my childhood's memory with dentist, soon it became the shadow of my life.Cant believe I need to handle all this through "
I got my front tooth fix 6 weeks ago. It suppose to be a simple filling process / restoration. Why I fixed my front tooth? It happened when I was in secondary school. A handsome dentists came to me and offered to fixed small little hole on my front tooth. Cant effort to say "NO". Day after that, I need to replace / refilling it for every 3 to 4 years.This was my third time replaced the old filling as it got loose. Back to my story today, a nightmare came recently,when I felt the pain 6 weeks after filling. At first I though sensitive tooth,he pain more sensible. Weird , I dint felt the pain during eat or talk, sometimes it disappear.When I thought it was getting better, I felt pain in the rhythm of 'lup-dup'(heart pump rhythm ) randomly, normally during sleep or do nothing. I sensed something wrong, but too busy to actually come to a solution(Exam period). Dragged it for 4 days hoping it will be okay soon. Worsting as expected. 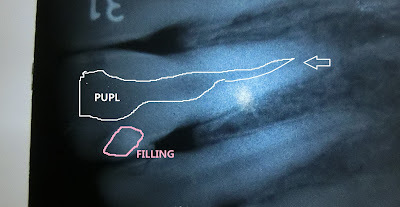 Pulpitis is inflammation of dental pulp tissue. The pulp contains the blood vessels the nerves and connective tissue inside a tooth and provides the tooth's blood and nutrients. Pulpitis is mainly caused by bacteria infection which itself is a secondary development of caries (tooth decay). No points for any guess, unless you seek for the professional. 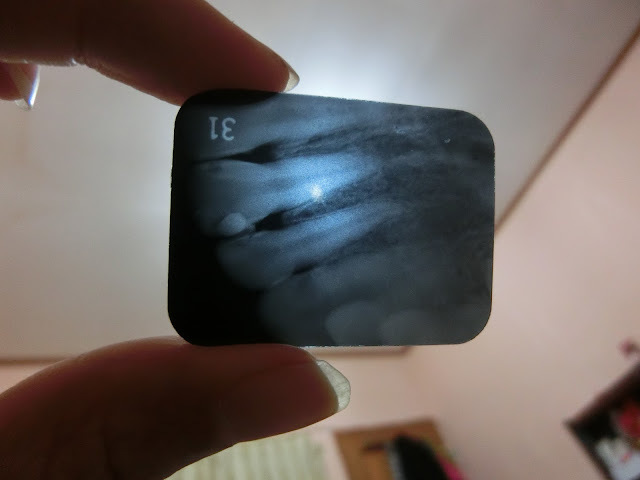 I went for dental check up and X ray. The white colour is PULP. The pink colour is FILLING. Both of them way too close. Unfortunately it matched my guess, diagnosed as pulpitis. Below was the explanation from my dentist. My pulp (the inner area of teeth) seemed to have larger size compared the other, maybe the age. Thus, the filling side wasnt big , but it reach at the pulp. The filling way too near to the pulp stimulated and cause the sensation. The other reason, might due infection in pulp. Things will get worst if it was infection as its irreversible. They really suggested me to get my canal treatment. Again , What is Canal Root Treatment? I think this photo might give basic imagination to all. Basically what I heard, dentist will first open tooth and remove/ killed the nerve [No Pain Sensation]. After the infected tissues removed and canal cleaned, the empty space filled with permanent material, then will be restored the tooth. So I turned my dentist down. I haven't and don't wish to received my treatment, maybe I need time to consider it. Another side, I really hope its not infection, but pain sensation induced by the filling when it came too close with pulp. I hope this would help for the one out there who have the same problem with me. "LAST LOCATION OF THE DAY , DINNER IN PASCAL FOOD MARKET"
The food market, the gathering of all sorts of foods. From Indonesia to Korea, from main course to snacks. Heaven of food? I m ALLODOXAPHOBIA, too much of choices dont seems good for me. It make me harder to choose. Another problem, my knowledge about those Indonesia tiny enough and kinda phobia to actually try those new foods. I prefer keep it simple, and order somethings common. This is the classic "safe" choices, GREENTEA, SOTO AYAM AND NASI BAMBOO (TAHU, TEMPE,VEGE,CHICKEN , RICE). Did you saw the brown colour things in rice, actually some spices which I wasnt very pleasant with that. Not that bad. When the night turn dark, slowly orange colour bulb turned on one by one. Live band play their music in front stage, entertained the people dining here. Pascal Food Market, big area which you can pick to dine indoor(under root) or outdoor. Personally more suggested outdoor, the nature wind while having dinner under the sky full of stars. If rain, just switch your place from outdoor to indoor. We picked the seat in the middle part, faced the live band stage. Outdoor view. I need spot light for my insta story . Camera always come first before food. I was walking to the entrance.That is an art work with millions of bamboo sticks. When come to DUSUN BAMBOO, the most exciting thing is SEE THE GIANT BIRD NEST. Try to live like a bird in the nest. Used to see the bird's nest in the advertisement mostly regarding to the Indonesia tourism. At first I really thought lots of the nest on tree and hang by those steel. After I came only I realise, the bird's nest,round shape of room made from half glasses that winding with the branch / root / some part of plants. The smart architecture idea might inspired by bird? The "bird's nest" build on the flyover bridge with glass, so can really enjoy the view. Sundanese food experience in the beautiful environment. Dont worry about the food, everything can get here. Small play park for kids, per entrance 50 k rp . There were one rabbits garden inside. Kids can feed them with vege and carrots. I m had been fascinated with the view of the lake. Its the most part I like the most about DUSUN BAMBOO. I fall in love with this place on my first sight. A floating area in the middle, surrounded with the bamboo houses.The water paddling activities in the flower/ swam boat, add sparkles to his area. Lets me tell you , why DUSUN BAMBOO ranked as NO 1 in my heart among of all the other. The reason is , I really can imagine how cool it will be if I held my wedding here.Yup its too early to think about this, but imagine bring no harm. Another serious problem I did concerned, the floating area kinda small, is it mean that should be limited number invitation , as I guess it cant hold our weight. If I fall in the water, this would be biggest jokes in my life.. Ticket per entry is 20 k rp. Keep the ticket nicely so can redeem mineral water / 1 pot of plant by 2 tickets. 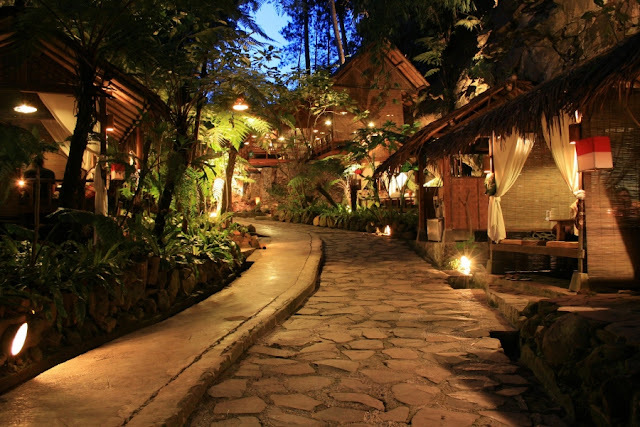 Kampung Daun is located up on a hill, restore the nature tropical forest beauty.The landscapes of this restaurant is well kept, even had a small waterfall inside. A cafe theme of nature, inside the tropical forest. Dining in small chalet surrounded by plants,sound of waterfall accompanied bird sing.This awesome scenery get my soul a temporary relax and felt high concentration of oxygen in every my breath. (This is describe how nature it is) They dont prepared you a fan, what you can get is nature air-condition. We went there around the hot sunny afternoon hour, the shield of leaves actually create cool and refreshing atmosphere inside. Once you choose the location you satisfied with. Take off the shoes and politely get inside the chalet. We picked the place near with waterfall on small hill.There provide comfy pillows inside. Some tourists found it too comfortable, and took a short nap after dine. No worries, the waitresses were too polite, they wont disturb your rest. We took for hours there chilling and enjoy our luxury tea time. Again , I almost forgot its actually a restaurants. For me the foods are variety from Indonesia cuisine to Western, breakfast to dinner, main course to dessert, all on the menu. So, just give Indonesia food a try, you will fall in love with it. The foods here were just common and dint "wow" me. The price is standard price, range of 40k to 100 k depends on food. Undoubtedly ,the environment truthfully awesome. The price with these dining experience damn worth it , you must give a try. I guess most of the tourists, basically paid high for the dining experience instead of food. I really willing to pay more for this environment.Chilled with bunch of friends , chit-chat from afternoon to night. Throw the hectic city life away, pampered self with this nature scenery. This is the night view with the bulb everywhere, create romantic moody night. I downloaded this night scenery from google, as we couldn't make it to stay till night, due to tight schedule. But I promised myself , I would definitely back and spent whole day in this place again. My mum, she so excited, like a kid come to playground. The cutest things were those ladies went around in group with those eyes catching red color costumes. If I had not mistaken, they were in Poland costume? (Correct me if I m wrong). I wish to have a bunch of friends to have fun when we are old. Farmhouse is an all in family package holidays destination. That's the reason why its so famous among of tourists, it was totally packed with millions of people (Am I a bit "hyperphora", but it described how crowded it was ) So better don't plan the trip on weekends or public holidays. Most of the place are instagramable. Nice and great photos without hesitated. You should be overwhelmed with the old style European style builiding, restaurants, bakery, cafe, coffee shop, pesdestrian, Hobbit house, wishing well and love locks wall. M I look like a model? She love this picture so much , decide make this as her profile pic. Make the Poland family as background. Wishing well : I wish I will be given the best luck for my life. Why I told its good place for kids? There is mini petting zoo where allow the close interaction of childrens with animals , rabbits, goats, birds. Also can feed the rabbits and goats, with carrots. This is the best way to expose kids to nature and cultured love among of them. Definitely will suggest my friends of this place.If I been asked to rank the FARMHOUSE, I would generously give 4.5 out of 5 stars. (Why not 5.0 stars ?) Its because the always, 5 stars / No 1 in my heart , is DUSUN BAMBOO LEISURE PARK. SHE IS VERY GOOD WITH THAT. Floating market, one of the attractive representative of Thailand. But do you know , actually there is a FLOATING MARKET in Lembang , Indonesia. It was another version of floating market, and the TOP 10 destination you should visit when come to Lembang. The floating market ticket costed 20 k rp per person and 15 k for parking slot. Keep the tickets with you as can redeem it with drink. You can choose either coffee, tea, lemon tea, or orange juice. 1 ticket for one drink, no refill rule here. The Floating Market , the concept of Bandung Original Street food, more variety of Indonesia food to try. Instead of telling this place is simple , I more prefer of using "Tradisional Indonesia style" to express the place. Small wood tables and chairs, with the handicrafts.The bamboo raft floating along the lake with boats selling foods and vegetables. At first I wasnt confidence about stepping on the bamboo raft, but it turned to be quite stable. We had memorable experience to buy food from the boats, it reminded me of the Thailand.This is small version of floating market compared to Thailand. We had our late lunch in Floating Market, the place quite average and standard. Having lunch with the wind along the lake view, another experience of dining.The price range from 20 k to 50 k depends on food, Most of them are selling Indonesia cuisine. Any food you can think, basically sell here. kupat tahu, mee ayam, kuih cubit, mee bakso, gadok-gadok...ect. I agree : "Food is the extraordinary medium for tourists know a country better"
Another side , beautiful flower garden park. A small pool for duckies , if I bring my little nephews, they sure will be so happy to see this. Place for rest , Indonesia small wooden house? room? A rest under big umbrella if u tired. Inside the Floating Market, actually there are few beautiful location. A cup of coffee in front lake. Please make sure bring sunscreen and sunblock with you, apply every 2 hours. Prevent sunburn. Not to forget to take photo in front of this landmark , represent Floating Market as memory.